A RIVER IS A LARGE STREAM OF WATER flowing in a bed or channel and emptying into the ocean, a sea, a lake, or another stream. Rivers have a starting point called a source, and a mouth, where they empty into a larger body of water. Its source may be a spring, lake, or mountain snowmelt, and its ultimate destination is generally an ocean, but its mouth may empty into a lake or another river along the way. Small tributaries combine with others to create larger streams; this is repeated many times to form the large main-branch rivers that reach the sea. Rivers are the sculptors of the landscape, shaping the Earth as they continually transport material from the land to the sea like conveyors. Some of the most permanent geographical features, they can outlive the largest mountains, watching them rise and helping to tear them down. Mountains are symbols of strength and durability, yet rivers cut through them like temporary annoyances, finding and exploiting their weak spots to plow water gaps and gouge canyons. As the demolition of mountain ranges is taking place, so is the creation of other landforms. Sediments carried from upstream are deposited at the river’s mouth, forming a DELTA. Deltas are low, flat, and wet areas that provide much needed wetland habitat. As the river approaches the sea, it will sometimes separate into many channels forming a bird’s foot delta. The deltas of the MISSISSIPPI and NILE Rivers are good examples. Floodplains are created beside rivers when sediments are deposited by floodwater. These plains are broad, flat valleys composed of organic rich sediments, making them ideal lands for cultivation. However, repeated inundation makes them risky places for human settlement. Rivers have played an important role as cradles of human civilization. The Mesopotamians flourished along the banks of the Tigris-Euphrates. 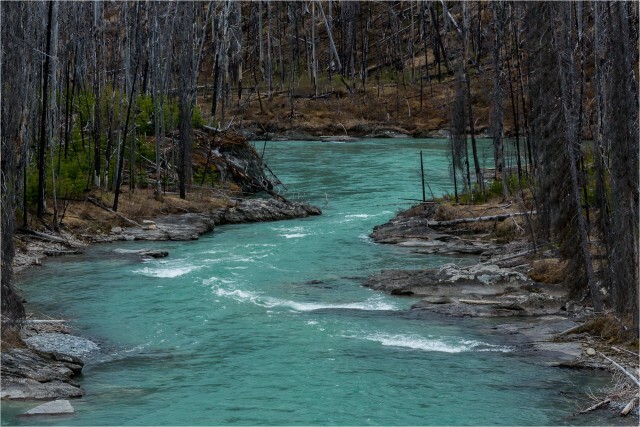 The rivers provided them with a food source, transportation, and most important, fresh water. The Euphrates is an exotic river, or a river that flows through an arid region. In the dry climate of what is now IRAQ, the Euphrates valley was a lush oasis. Its water was not only used for drinking, cooking, and bathing, but also for the irrigation of crops and a source of fish. Canals, early pumps, and augers flooded fields with river water, enabling the desert floor and early human civilization to flourish. This happened along many other rivers as well, such as the INDUS, Nile, and the CHANGJIANG (Yangzi) and HUANG (Yellow) rivers in CHINA. Humans have not distanced themselves from rivers in modern times. River valleys are still favored locations for population centers. America’s early urban areas developed around mills and factories that harnessed the power of rivers cascading over the Piedmont. These rivers provided water, energy, and transportation to the sea. Rivers powered the INDUSTRIAL REVOLUTION in the UNITED STATES, helping to strengthen the new nation. Rivers farther west would be the arteries that helped expand it. Transportation has always been an important use of rivers. Before jumbo jets and freeways, rivers were the world’s highways. They have provided paths of exploration and trade routes of commerce. Movements of people and goods have followed river routes since the ancient Mesopotamians transported grain on reed rafts. In more recent times, rivers served as paths for exploration and expansion of the western United States. LEWIS AND CLARK used the Missouri River to travel and survey the vast lands of the LOUISIANA PURCHASE in 1804. Robert Fulton’s invention of the steamship made river travel viable upstream as well as downstream. Waterways like the Mississippi and Ohio rivers opened up world markets to formerly LANDLOCKED producers. Steamships dominated transportation for a short time in the 1800’s, but were replaced by more versatile railroads. Today, barges still carry large freight loads, but in many places rivers are now considered barriers to transportation rather than the source of it. Networks of highways and railroads can move cargo to more places in less time. After centuries of serving as essential travel routes, the river’s role in transportation is quickly fading in many parts of the world. Rivers have not been treated well for their help in advancing civilization. Instead, they have been treated like prisoners and sewers. Rivers today have been polluted by industry and incarcerated by engineers. Very few remain untouched. Pollution may be the worst illness rivers face. Chemicals from industry, waste from human settlement, and agricultural runoff have all acted to degrade the health of rivers and their ecosystems. Fish, plants and animals are not the only victims. By poisoning our fresh water supply we poison ourselves. Ignorance is the excuse of the past, and with gained knowledge and awareness, river conservation is the responsibility of all humans. Dams and levees constrict the flow of rivers and confine them to narrow channels. Flood control structures prevent rivers from spreading over the floodplains they took several millennia to create. Natural fertilization of the plains has been restricted, forcing farmers to apply chemical fertilizers. While the frequency of floods has been reduced, the magnitude has increased. Rivers have often been compared to the human life cycle. Upper reaches of rivers are usually small, fast-moving streams that are seen as adolescents with youthful energy. In their lower reaches they become wide and slow in appearance, carrying with them the sediments and memories of the miles they’ve traversed. Rivers have provided us with water, power, and transportation. But those who live on their banks may argue that their most precious gift is a sense of place.